Romney's blaming of "takers" in the name of "makers" invokes more lies and distortions than you can count. Human nature is not one thing. It is multifaceted on its face, multi-dimensional within, and it spans a broad range across every dimension it encompasses. Still, there are large-scale commonalities that encompass much, even while leaving much else out. The tendency to divide the world in two is just part of what makes us human - as is the contrasting tendency to see and make it whole. "There are 47 per cent of the people who will vote for the president no matter what... who are with him, who are dependent upon government, who believe that they are victims, who believe that government has a responsibility to care for them, who believe that they are entitled to health care, to food, to housing, to you name it. That that's an entitlement... These are people who pay no income tax. Forty-seven per cent of Americans pay no income tax. So our message of low taxes doesn't connect... And so my job is not to worry about those people - I'll never convince them that they should take personal responsibility and care for their lives." Of course, it was a ludicrous statement on many levels and in many ways. Perhaps, too many to make sense of, or even count. Most obviously, it's the president's job to worry about all of the people - as President Obama lost no time in pointing out. Less obviously, perhaps, but just as importantly, most lower-income Americans who pay no income tax pay plenty of other taxes - Social Security and Medicare taxes at the federal level, and significantly more state- and local-level taxes than higher-income Americans as well. A 2009 study of all state and local tax rates, found that the wealthiest 1 per cent paid an average rate of 5.2 per cent, compared to 10.9 per cent for the poorest 20 per cent (in the most regressive state, Washington, home to Bill Gates, the top 1 per cent paid just 2.9 per cent in taxes, compared to 17.3 per cent for the bottom 20 per cent). Not only that, but plenty of lower-income Americans who don't pay income taxes also vote Republican, as shown in the 2008 exit polls. Sure, more of them vote Democrat, but the Republican share is far from zero, just as the Democratic share of high-income voters is also far from zero. But these are just elementary bone-headed idiocies, whose negation leads back to everyday sanity. To go further, into real insights, we need to consider some other falsehoods stirred into the Romney mix. There are many we could focus on, but for brevity's sake, I'll confine myself to just three: First, the misunderstanding of who benefits from government programmes: it's virtually everyone. Second, the misleading, demonising nature of the divide in who benefits: it's not "makers vs takers", since virtually everyone does both. Rather, it's primarily a divide between "income maintenance" - keeping people afloat and sustaining social cohesion - which goes primarily to low- and middle-income Americans, and "wealth creation", which goes primarily to higher-income Americans. In both cases, the programmes largely do what they're designed to do. Third is Romney's implicit claim that Obama's policies are driven by a desire to cater to those on the bottom, to coddle them. In fact, empirical evidence shows that low-income voters have virtually no impact on elected officials - exactly what you'd expect in today's money-driven system. Let's examine each of these in order. Perhaps, the most fundamental lie involved in Romney's attack is that some people - society's losers - benefit from government programmes while others - society's winners - prosper on their own. The first two lies described above both flow directly out of this. The first lie - essentially that "real Americans" don't get help from the government - is widely, but mistakenly believed. Somehow, millions of Americans seem to miss the fact that they were educated in public schools, regularly drive on public roads, are protected by public police and fire departments, etc. But beyond such obvious examples, a major reason for this is the growth of what are known as tax expenditures as a percentage of the total economy, which is the subject of Suzanne Mettler's 2011 book, The Submerged State: How Invisible Government Policies Undermine American Democracy. 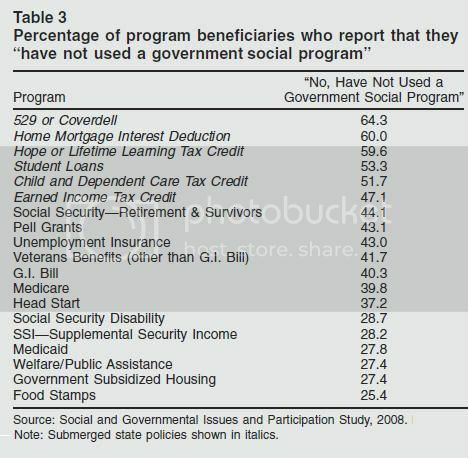 Before her book was published, I wrote about her earlier paper in which she presented a chart showing the percentage of people benefiting from different government programmes who report that they "have not used a government social programme". The percentages ranged from 60 per cent and more (those getting a home mortgage interest deduction, for example) down to the mid-20s (food stamps, government-subsidised housing) with programmes like veterans benefits and Medicare falling in the mid-range around 40 per cent. Describing the results, Mettler wrote, "Notably, the six italicised policies that head the list are precisely those belonging to the submerged state: tax-deferred savings accounts, several tax expenditures and student loans. Given the design and manner of delivery of these policies, few individuals seem to perceive them to be social benefits." Furthermore, she noted that "Paradoxically, these policies, although they permit individuals to pay significantly less in taxes, do not alter their view about the tax system... By contrast, experiences of benefitting from direct visible federal social programmes do appear to influence individuals' views of tax fairness in a salutary manner." Thus, Mettler's work not only helps explain why many people mistakenly think they don't receive government support, it also helps explain why they feel unfairly taxed despite the benefits they receive. We'd all like to believe we did everything ourselves, even though we're building on thousands of years of accumulated social wealth and wisdom. Tax expenditures make this illusion much easier to sustain. And they're growing, too. In Washington Monthly, Mettler wrote, "These tax expenditures for individuals and families represented 7.4 per cent of GDP in 2008, up from 4.2 per cent in 1976 (tax expenditures for business, such as those for the oil and gas industry, made up another 1 per cent). By way of comparison, Social Security amounted to 4.3 per cent of GDP in 2008; Medicare and Medicaid, 4.1 per cent." Targeted tax cuts are a favourite conservative strategy - they're the one way conservatives have long favoured government assistance. And it shows in their substantial growth in sheer numbers as well: "From the time Ronald Reagan took office in 1981 until 2010, the number of such tax subsidies had increased by 86 per cent, from 81 to 151," Mettler added. Yet, Romney claims his proposed massive tax cuts for millionaires - above and beyond the Bush tax cuts - will be revenue-neutral, in part because of closing such loopholes, although, typically, he refuses to say which ones. Tax expenditures are also involved in the second big lie contained in Romney's 47 per cent remarks, the misleading, demonising characterisation of the divide in who benefits pitting "the makers" vs "the takers". As explained in several different reports in recent years, the real divide is between "income maintenance" programmes which were never intended to help individuals build wealth and "wealth-creation" programmes which were. Tax expenditures play an outsized role in wealth-creation programmes, which helps keep them in the background, despite their substantial significance. The first such report came from the Urban Institute in January 2008, "How Much Does the Federal Government Spend to Promote Economic Mobility and for Whom?" It examined hundreds of government programmes, then tallied all federal spending and tax subsidies aimed at promoting economic mobility for 1980, 2006 and 2012 (projected). The report cited "two major conclusions". First, that "poor and lower-income households owe little or no tax and so are excluded from the bulk of economic mobility programmes, which are often delivered in the form of tax subsidies" and second, that "while these households do benefit from many other federal programmes, those programmes generally are not aimed at promoting mobility - and sometimes even discourage it". Illustrating the importance of tax expenditures, in 2006 the report found, "about $212bn or 1.6 per cent of gross domestic product (GDP) in direct spending and another $534bn or 4.1 per cent of GDP in tax subsidies went to programmes aimed at promoting mobility, for a rough total of $746bn." The four largest categories were employer-related work subsidies, homeownership, savings and investment incentives and education and training. While these all sound like broadly positive policy goals, the benefits went overwhelming to those already doing very well. Most broadly, the report found that 1.6 per cent of GDP ($205bn) went to low-income households, while 4.1 per cent of GDP ($540bn) went to high-income households. More specifically, the report found that 68.6 per cent of all wealth-building tax expenditures went to the top 20 per cent - with 27 per cent going to the top 1 per cent alone and 16.1 per cent going just to the top 0.1 per cent. There was only one such programme that skewed toward the lower incomes, rather than the top: the earned income tax credit. The bottom 40 per cent got almost 78 per cent of all EITC benefits, while the top 40 per cent got less than 1 per cent. But the EITC - initially heavily promoted by Ronald Reagan, and then further expanded by Clinton and Bush - is one of the main reasons that so many millions of Americans no longer pay any income taxes. As Rick Perry would say, "Ooops!" "The inequities extend beyond poor families. A typical middle-class household making $50,000 a year receives less than $500 in benefits from the most expansive of these federal policies annually; families making $100,000 get about $2,000. By contrast, taxpayers bringing in more than $1 million enjoy $95,820 in annual support through mortgage and property tax deductions and investment tax breaks." "President Obama and I both care about poor and middle-class families. The difference is my policies will make things better for them. We shouldn’t measure compassion by how many people are on welfare. We should measure compassion by how many people are able to get off welfare and get a good paying job." While it's nice to see that Romney's corrected course on his most egregious mistake - claiming that it's not his job to care about almost half the population - eight years of President Bush say that Romney's economic policies will only bring more disastrous results, since he's done absolutely nothing to distinguish his policies from Bush's, which delivered the worst job growth of any president since the Great Depression. But there's one more big lie wrapped up in his remarks that bears further scrutiny. The implicit lie that Obama is responding to the "something-for-nothing" demands of the losers who vote for him. I've already talked about the gross mischaracterisation of Obama's electoral base, but there's more going on here: the gross mischaracterisation of how American politics works. "Using both summary measures of senators' voting patterns and specific roll call votes on the minimum wage, civil rights, government spending and abortion, I find that senators in this period were vastly more responsive to the views of affluent constituents than to constituents of modest means. Indeed, my analyses suggest that the views of constituents in the upper third of the income distribution received about 50 per cent more weight than those in the middle third (with even larger disparities on specific salient roll call votes), while the views of constituents in the bottom third of the income distribution received no weight at all in the voting decisions of their senators." The chart Hayes posted showed even more: For middle-income voters, senators of both parties were roughly equally responsive, but for high-income voters, Democratic senators showed roughly the same level of responsiveness, while the responsiveness of Republican senators more than doubled. What this shows is the exact opposite of what Romney is claiming. It's not that Obama and the Democrats are beholden to coddling society's losers, as they would put it. It's the Republicans who are beholden to the winners. And the winners, not incidentally, get much, much more from government than the rest of us can even imagine. None of this is to say that the rich are essentially different from the rest of us in a stark two-category way. Past wealthy leaders like FDR and JFK easily give the lie to that. We need to look beyond the individuals to the social context they live in. The rich today have far more of society's wealth and power, with far less opposition than they faced 30 years ago. The differences we see today - reminiscent of those from the Gilded Age and persisting through the Great Depression - are predominantly situational ones, the reflection of a diseased, decaying and dysfunction political system. So the rich have unchecked power, and they use it... an all too human response. If they actually had any idea how to fix things, this might not even be so bad. But the unchecked power itself is what's most in need of fixing - so what are the chances of the rich fixing that? To put it most charitably, the rich today have no more idea of how to fix things than anyone else. Don't believe me? Just look at Mitt Romney, for crying out loud!